At some point, you might have the opportunity to host a social business event. 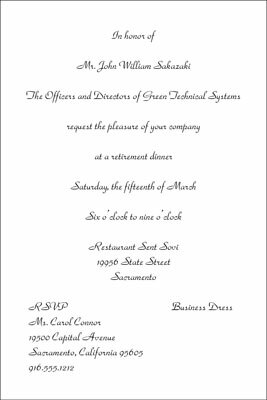 Make sure you send your business invitation promptly to leave time for the invitations to be returned — either accepted or declined — well before the event. Also, make sure that everyone who should be invited is invited. If the event is a sit-down dinner, the invitation should say dinner. Cocktails in an invitation mean that hors d’oeuvres will be provided, but no more. Determine how invitees should respond — by e-mail, telephone, or by return reply card. If a reply is requested, put the letters RSVP near the bottom of the invitation. Add Regrets Only if you don’t want invitees to respond if they’re going, only if they’re not going.